Ken Block Drives Ford Fiesta ST in "Ultimate Gymkhana"
Let’s start the week off with a ton of tire smoke and squealing, shall we? 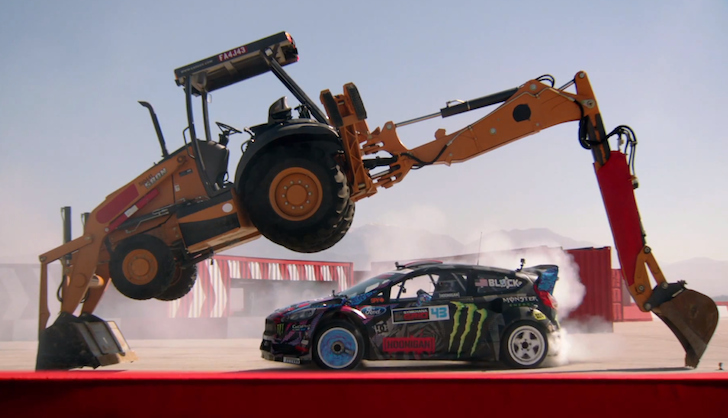 Ken Block and his 2013 Ford Fiesta ST race car are back with Gymkhana 6: The Ultimate Gymkhana Grid Course. For the uninitiated, gymkhana started as an equestrian event. Barrel, flag, and keg racing, events you might see at a rodeo, all qualify as gymkhana. In motorsport gymkhana drivers are judged on the time and/or speed with which they navigate often complex obstacle courses. Mr. Block is one of the best. His latest course features jumps, a wrecking ball, “police” in Lamborghinis, and Segue Scooters, to name a few. Enjoy! Tip: If you’re at work, you might want to turn down the volume!